Even knowing he would hunt her down, Laney gave the FBI the information they needed to throw Rolly, her violent and abusive husband into prison. She has run to the very end of the earth –– to Bangkok to hide from him. But when she spots his enforcer walking into the restaurant where she is having lunch, she knows it’s time to run. Macmillan is a hunter, but his weapon of choice isn’t a gun, it’s language and words. Using their very own words he hunts down international criminals and then when he’s completed his mission he disappears into the night. He’s in Bangkok to identify and catch the Jazzman, an arms dealer who is selling a weapon that could bring governments to their knees. When he sees Laney singing at the hotel where the auction is set to take place, he immediately knows she is on the run, and he feels an instant attraction to her. Then he discovers she may hold the key to finally identifying the Jazzman. Romantic Suspense is a genre dominated by archetypes and tropes. There aren’t too many books that surprise me. Well, Carolyn Crane has once again managed to find something I have never seen before, a quirky…perhaps even oddball idea, and fashion it into a believable and entertaining story. I could go on for pages about the many ways I loved this book, but maybe I’ll just encourage you all to buy this book and find out for yourself…and while you’re at it, read her Disillusionists series. Many thanks to CrushStar Multimedia and Netgalley for providing me with this ARC. 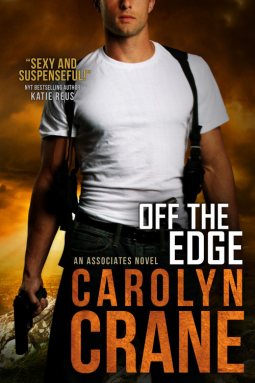 This entry was posted in Uncategorized and tagged Against the Dark, Carolyn Crane, Off the Edge, romantic suspense, The Associates by setaian. Bookmark the permalink.